There’s a brand-new movie at the OMNIMAX theater at the Cincinnati Museum Center and you simply must take your whole family to check it out! I’m going to be honest…before I saw Flight of the Butterflies last night all I knew about the life cycle of the butterfly was what I had read in the Very Hungry Caterpillar by Eric Carle. I had never given much thought to how extraordinary and complex a butterfly’s life really is. Especially the Monarch butterfly. This movie was enlightening & educational for the whole family. I took my three sons (ages 3, 5, and 7) and I loved listening to their chatter on the way home about all they had learned in the film. The iconic monarch butterfly is a true marvel of nature. Weighing less than a penny, it makes one of the longest migrations on Earth across a continent, with pinpoint navigational accuracy, to a secluded place it has never been. Follow the monarchs’ perilous and extraordinary journey and join hundreds of millions of real butterflies in the remote mountain peaks of Mexico. For the first time ever, look inside a chrysalis, thanks to advanced MRI and micro CT scans. Be captivated by the true and compelling story of an intrepid scientist’s 40-year search to find their secret hideaway, with the help of citizen scientists across North America. Supported by the National Science Foundation and a high quality educational outreach program, the film interweaves spellbinding natural history with an uplifting human story. Featuring breathtaking cinematography and an award-winning production team, including Oscar® winner Peter Parks, the film has received consistent rave reviews in independent audience tests across all age groups. Unravel the mysteries and experience the Flight of the Butterflies. Take a few minutes and head over to the OMNIMAX’s website to read reviews on the show and see the trailer…you will be amazed! This show really is perfect for all ages…Henry just turned three a few weeks ago and he sat mesmerized by the butterflies, the show held his attention the entire time, even when there were folks talking and no butterflies to be seen (which wasn’t very often at all). The show is less than an hour long, and is now playing daily at the OMNIMAX. You can reserv e tickets online. And check out the Flight of the Butterflies website for teaching resources and coloring sheets for the munchkins. These coloring sheets were great, I’m going to bookmark that page for when I go back to teaching, they’d be a great classroom resource! And the boys loved them. So pack up the family, spend a day at the Museum Center and be sure to hit the OMNIMAX for a showing of Flight of the Butterflies. You won’t be sorry! And after the show, stop by the Museum shops for all sorts of fabulous butterfly items…mugs, shirts, nets and much much more! The Cincinnati Museum Center is located at 1301 Western Avenue in Cincinnati. 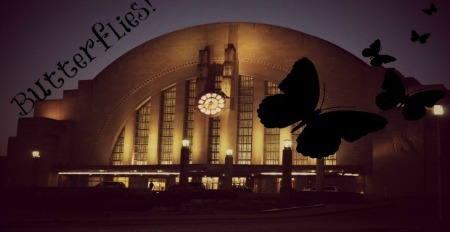 Check out the Family Friendly Cincinnati Forum now through February 20th and enter our giveaway….we have a family four pack of tickets to see the Flight of the Butterflies to share with one lucky reader! When not blogging for Family Friendly Cincinnati, you can find Katie writing at her personal blog, www.thelittlethingsjournal.blogspot.com. Disclaimer :: I was given four complimentary tickets to see Butterflies in Flight, but my opinions on the show are all my own. It was fabulous, and had I not been given tickets we would have gone to see it anyway…in fact I might go again so that Ella can see the show. you would use just for heating food or baking or grilling.